For ecologists, "natural experiments" that arise from severe weather events, habitat destruction, or invasive species give unique insights into how ecosystems operate. A fascinating example of such a scenario is a recent study that looked at how the loss of birds from Guam impacted the spider population on the island. What led to the dramatic loss of birds on Guam? Well this part of the story isn't actually so "natural"—although it was unintentional. 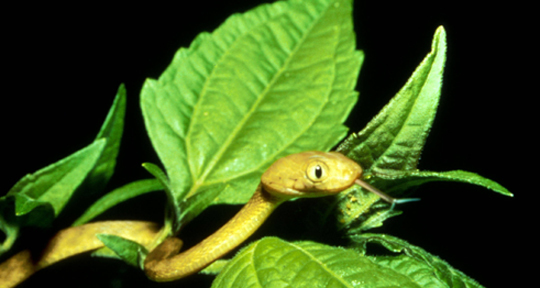 Sometime in the mid to late 1940s, brown tree snakes were introduced to the island probably by hitching a ride on a cargo ship after World War II. Because there aren't many large predators on Guam, the snakes quickly took over the island. By the 1980s all the birds were wiped out save for two colonies that continue to exist on a military base. To this day the snakes are still around (one of the attempts to control them involved dropping Tylenol-laced mice from airplanes). Invasive species generally aren't good, but they do offer a unique opportunity to study how parts of an ecosystem are related. What happens to spiders when you remove birds from a tropical island? The researchers found that during the dry season Guam had 2.3 times more spider webs than neighboring islands that still have birds. During the wet season the number of webs was a whopping 40 times higher on Guam. And the spider webs on Guam were much larger—50% larger—than those on the other islands. Removing birds from the equation likely changed the Guam spider population in many ways including some (or all) of these scenarios: (1) since birds weren't around to eat the spiders the spider population grew, (2) the spiders no longer had to compete with the birds to eat insects so more spiders survived and were able to reproduce, (3) the spiders didn't have to keep spinning new webs because the birds weren't there to mess them up anymore, so they built larger webs and put more energy into reproduction. Because the results of this study varied significantly from small scale short term controlled experiments, they highlight the importance of taking advantage of large scale and long term "natural experiments." Unfortunately, it is becoming increasingly vital to examine how the loss of birds, the top predators for many food chains, impacts ecosystems as habitat destruction (and housecats) continue to decimate bird populations.